On Oct. 2, the Pacific Crest Trail Association joined the Appalachian Trail Conservancy to celebrate both trails’ 50th anniversary with an extraordinary four-hour live webcast broadcast from the Girl Scouts Heart of Central California Regional Program Center in Sacramento and ATC headquarters in Harpers Ferry, West Virginia. The event was sponsored by Sierra Nevada Brewing Company, Northwest Federal Credit Union, with additional support from Gossamer Gear, Osprey, REI and Vasque. The celebration also included an online auction with a variety of gift packages including tours of the Sierra Nevada breweries in California and North Carolina, vacation stays, Napa Valley balloon rides, outdoor gear, and more. All funds raised benefit both the PCTA and the ATC. At 11 a.m. Pacific time, the webcast went live, hosted by National Geographic Adventurer of the Year and endurance hiker Jennifer Pharr Davis. The four-hour broadcast brought together a who’s who of live guests along with 20 prerecorded videos produced for the webcast. Watch a recording of our 50th anniversary celebration! The first hour featured PCTA Executive Director and CEO Liz Bergeron in conversation with Appalachian Trail Conservancy President and CEO Suzanne Dixon, followed by an interview with craft beer legend Ken Grossman, founder of Sierra Nevada Brewing Company. Then former PCTA board member and well-known trail angel Barney “Scout” Mann joined the ATC’s Laurie Potteiger for a segment on the history of the nation’s first two national scenic trails. The second hour featured author Cheryl Strayed in conversation with Jennifer Pharr Davis. Strayed, who wrote the memoir Wild that inspired a wave of interest in the PCT and long-distance hiking, spoke eloquently about her own experiences on the PCT and other trails. She also spoke about the importance of national trails, both to her family and to the nation and its people. The webcast’s third hour began with two large anniversary cakes and each great trail toasting the other in a salute to a successful first 50 years as national scenic trails—and hopes for an even more successful 50 years to come. The remainder of the webcast was filled with remarks and videos from every corner of the Pacific Crest and Appalachian Trail communities—including volunteers, students, hikers, and trail advocates. Other special guests included California Senator Robert Hertzberg, Oregon Congressman Earl Blumenauer, Dr. Tyler Nordgren, noted astronomer and night sky advocate, YouTube trail celebrity Darwin, and the federal agency managers of both trails: Beth Boyst and Jim Bacon from the U.S. Forest Service for the PCT, and Wendy Janssen and her National Park Service team for the AT. The Oct. 2 date of the event was chosen because it marked 50 years to the day when the National Trails System Act was signed in 1968. 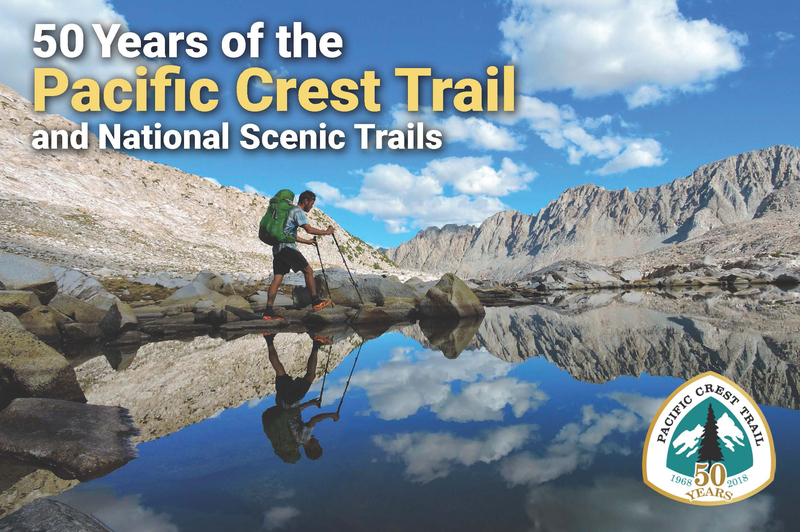 This visionary act designated the Pacific Crest and Appalachian trails as our nation’s first National Scenic Trails—a number which has today grown to include nine other National Scenic Trails, 19 National Historic Trails, and over 1,000 national recreational trails. Scott Wilkinson is the PCTA’s Director of Communications and Marketing. A former professional musician, Scott has 20+ years of experience in almost every marketing role. Before joining the PCTA he was a marketing/creative director at West Virginia University and the University of Oregon. A serious outdoor addict, Scott is an experienced whitewater paddler, hang glider pilot, flyfisher, mountain biker, and (of course) hiker and backpacker.